If go problems are your cup of tea, a new shop may have just the thing for you. The Go Shop carries a neat line of go “tumblers” or insulated beverage containers. 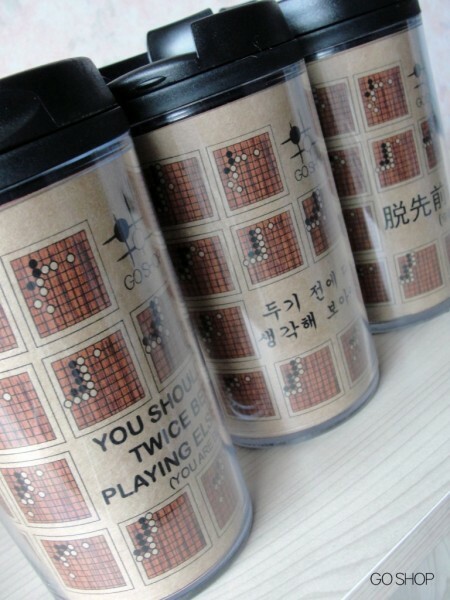 The Fuseki Series includes the Chinese Opening, Kobayashi, Mini Chinese Opening and San Ren Sei, and there’s also a Corner Problems tumbler and a Go Board tumbler. All are offered in English, Chinese or Korean. To carry your tumblers, and other go materials, the Go Shop also carries a go-themed tote bag. “For us, every small move counts,” says the Go Shop.